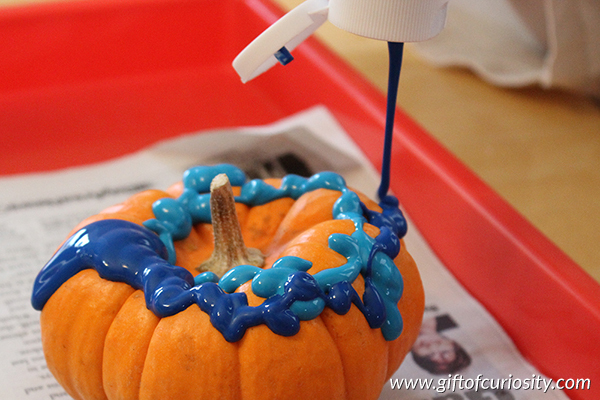 Drip-painted pumpkins: an awesome new way to decorate pumpkins for Halloween! I love carving pumpkins as much as the next person. But after years of carving pumpkins, carving was starting to feel a little ho-hum. So I was looking for a different way to decorate pumpkins for Halloween. 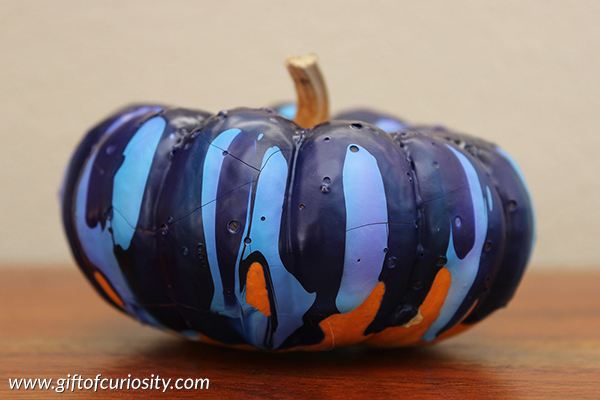 Fortunately, I discovered drip-painted pumpkins as a fun (and less messy!) 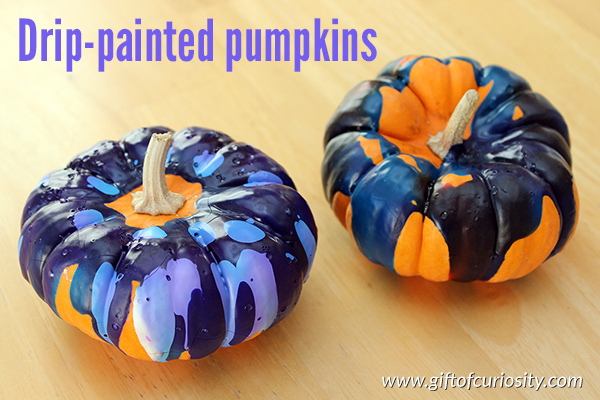 way of creating some beautiful Halloween pumpkins. 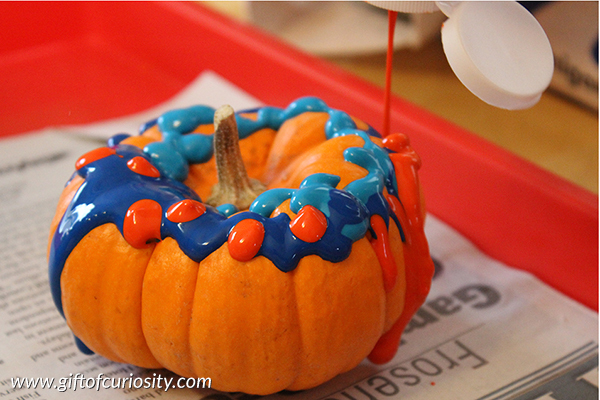 Note: For more kid-friendly Halloween crafts, see my Halloween activities for Kids page. We decided to use our mini-pumpkins as the “canvass” for our drip paintings. I set them on a tray covered in newsprint to contain the mess. Then I invited my kids to select three colors of tempera paint to apply. 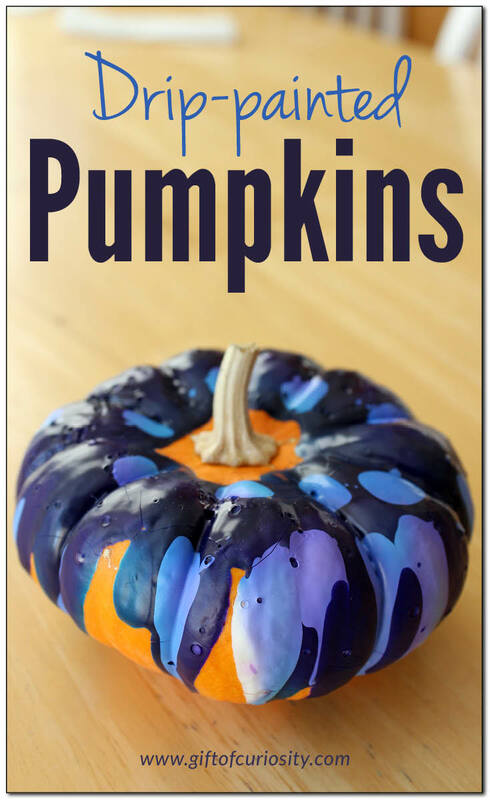 They squeezed a generous amount of paint onto the top of the pumpkin, allowing it to drip down the sides due to the force of gravity. The end result was quite beautiful. The paint cracked a bit when it dried, but the overall look was still quite striking. Some of the colors blended together a bit, creating new and beautiful color combinations. And the clean up was sooo much easier than the clean up after carving pumpkins! And perhaps best of all, these pumpkins won’t rot in a few days like our carved pumpkins, so we can make them at the beginning of October and they will last all month long! For more fun-filled Halloween activities, see my Halloween Activities for Kids page and my Halloween Activities for Kids Pinterest board. What a cute idea. My 2 year old would love this. She loves painting anything!